Being laid off has left me with a sense of having lots of time on my hands and even though my natural tendency to cram days full to the gills makes that unlikely, it’s nevertheless unleashed a desire to make things from scratch. So when my friend Brandy suggested we make three cheese ravioli with mushroom ragù, I got out the apron in a hurry and hustled over. Mix about 1 1/2 C of All Purpose flour and 1 1/2 C of Semolina flour in a bowl and the pour it on the counter, making a well in the centre. Add some salt. Beat 4 eggs in a separate bowl and add them to the centre of the well. Slowly mix the dough with your fingers and knead it into a ball. 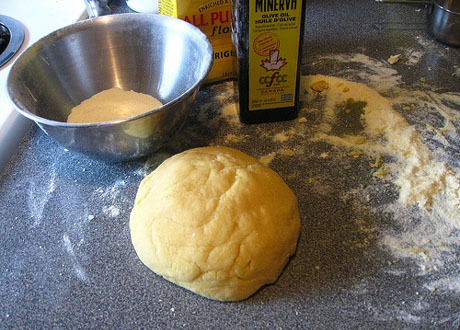 Add a bit of olive oil drizzled on top and knead until the dough feels elastic. Do not over knead it. Cover the dough with plastic and put it in the fridge. Let it rest for an hour or so. 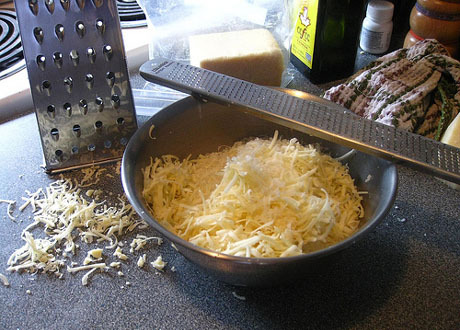 Mix 1 package of David Wood’s truffle chevre, about 3/4 C of Gran Padano and 3/4 C of white cheddar, loosely grated. Add 2 tbsp of fresh thyme and the same of flat leaf parsley and some salt and pepper then put it aside. Heat some olive oil over medium high heat. Add in one onion, diced and cook until tender. Splash in some wine and reduce. 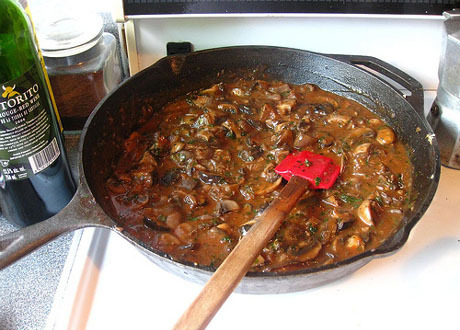 Add 1 lb of assorted fresh mushrooms and cook until the mushrooms begin to release liquid. Stir in 2 cloves of garlic, minced, 3 tbsp of fresh thyme and some salt and pepper and cook for a few more minutes, until the mushrooms begin to brown. Add 1 tbsp of tomato paste and cook for 2-3 more minutes before adding 1 1/2 C chicken stock. Reduce 10 minutes, stirring occasionally. You can get the pasta dough out of the fridge now to let it warm up a bit, then finish the ragù with 2 tbsp of butter and 1 1/2 tsp of balsamic vinegar, some parmesan cheese and flat leaf parsley. Keep it warm on the stove, stirring occasionally. Now comes the assembly. Roll out the pasta dough, sprinkling it and the counter liberally with flour. It should be thin enough that you’re not going to get a mouthful of dough when you eat it, but thick enough that you can pick it up and handle it without it ripping. 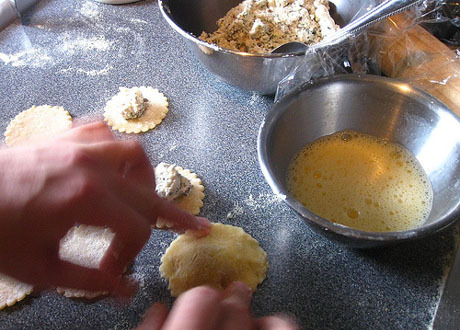 With cooking cutters, cut out an equal number of tops and bottoms for the raviolis, the tops being slightly bigger than the bottoms. Lay them on a cookie sheet and keep them from drying out while you work by laying a moist towel over top. 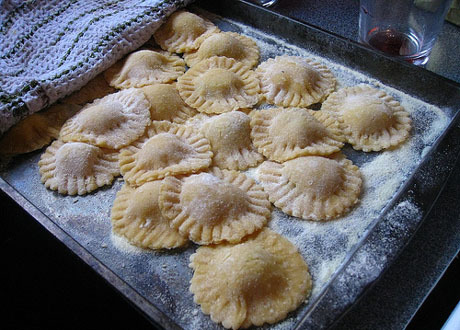 This is rich pasta, so 6-7 raviolis per person should be good for dinner. When you have enough, make a small amount of egg wash in a separate bowl. This will be used to hold the dough together. Lay the cut-outs on the counter, scoop a ball of cheese mixture into the centre, brush some egg wash around the edge with your finger and press the tops on with the end of a fork. Put them back under the moist towel until you’re ready to cook them. Just before eating, boil a big pot of salted water and cook the pasta until it’s tender, a couple of minutes. Plate the pasta and top with ragù. Garnish with grated parmesan. That ragu looks so good. Does cooking with a Cast Iron pan make a difference for a mushroom recipe like this?